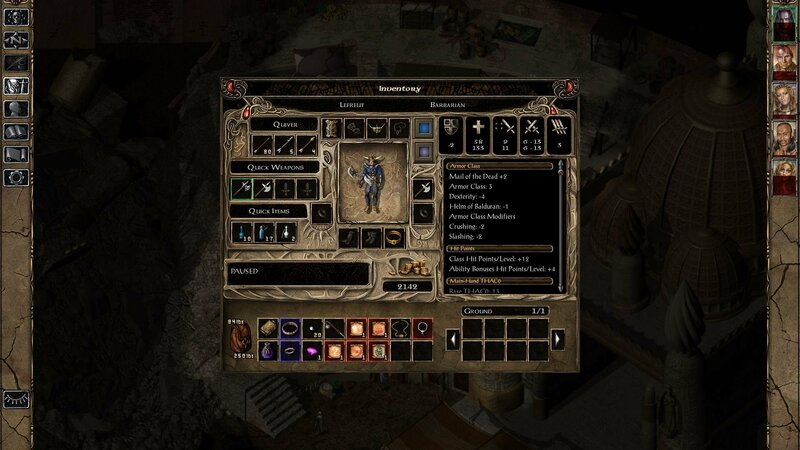 This tweak implements the improved inventory screen (see the discussion here). I have fixed the issues reported by @Mr2150 and I have made a version for all 3 games so I decided to post everything in a new topic. The UI.menu and the 3 pngs must be copied in the override folder of the game. v0.3: Add scrollbar to ground items. Reduce png size. v0.2: Add version for all 3 games. Fix item comparison when the average damage is the same. See the first post for the updated archives. Yes you need to put the UI.menu and the pngs in the override folder and it should work. On which version of the game are you trying to use this tweak ? I am playing the Steam version on a Mac. Hello, @lefreut ... I am confused, sorry my ignorance . 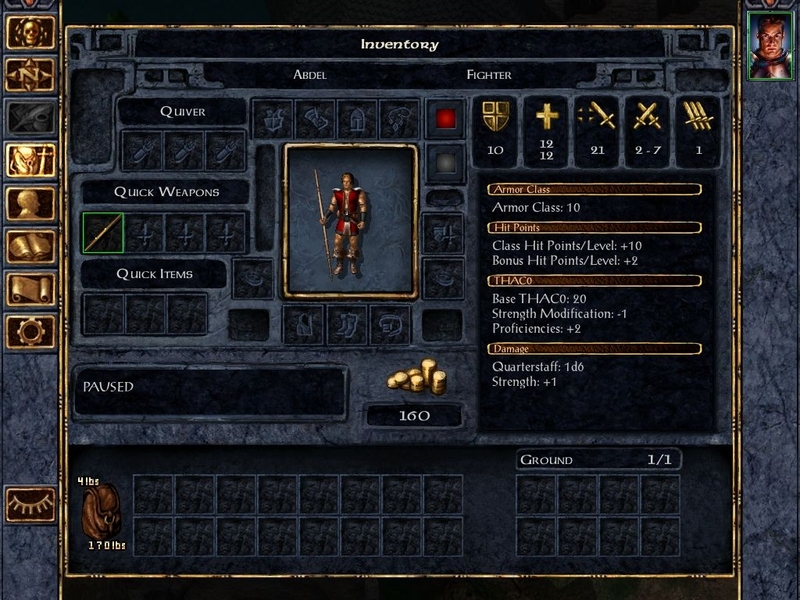 I am playing a heavely modded version of GOG ( BWS ) version 2.3.67.3, with Dragonspear . 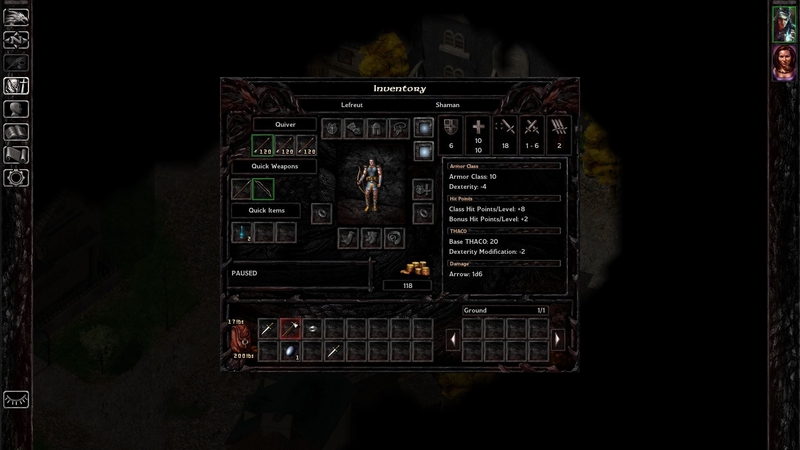 I use @Pecca ´s mod Dragonspear UI++, so I already have a UI.menu on override. I am currently on Nashkel mines, so I am not yet started Dragonspear. I am interested on the scrollbar on loot screen. Which one should I use ? Inventory-BG1 or Inventory-SOD ? Also, I have to edit UI.menu like a common text file, with, lets say, notepad ++ ? I don't have a Mac, but it should work the same as for Windows. You need to create the override folder next to the chitin.key file. You should use Inventory-SOD. 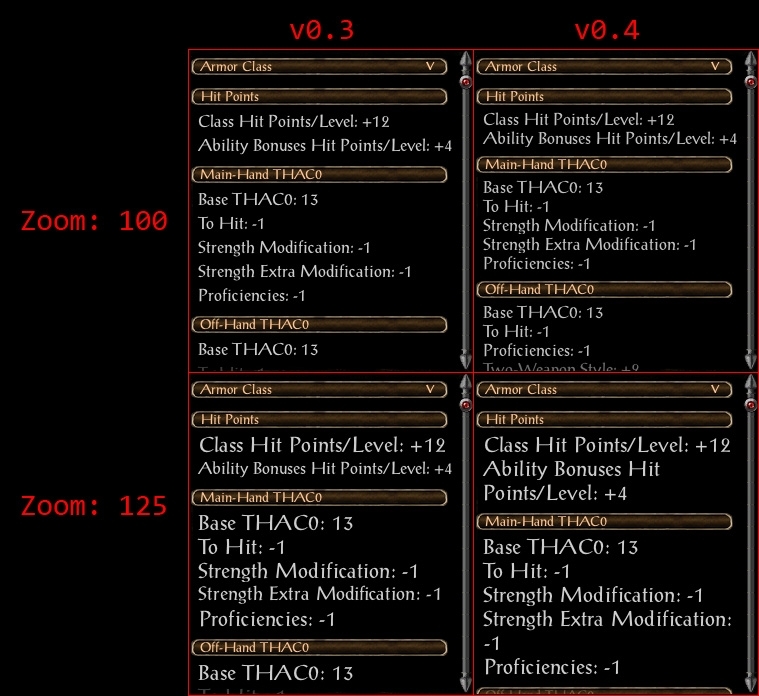 But Dragonspear UI++ also change the inventory screen, both tweaks are not really compatible. Yes UI.menu is a text file, you can edit it with any text editor. Thanks for answering, gonna sugest to @Pecca something similar for his mod. Many thanks. @lefreut Thanks! The problem was that I had placed those files in the "override" folder that comes when you install the game; so I created another "override" folder in the same location of the chitin.key file and then placed there your files. However, good job!! 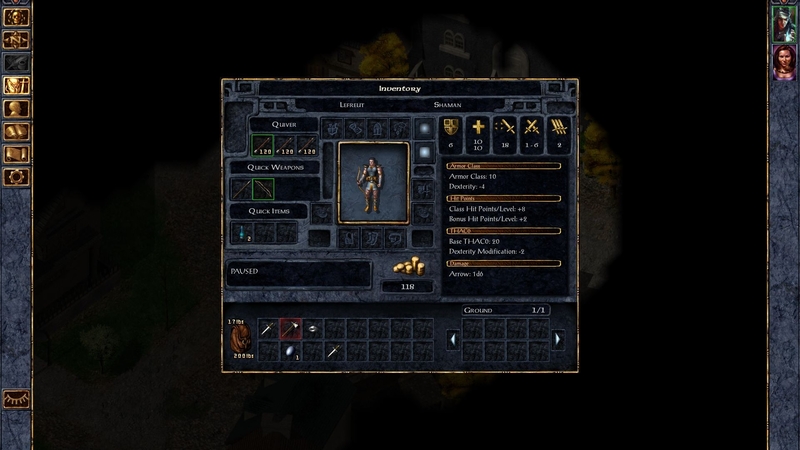 @lefreut would it be possible to make the text in the inventory respect the font size picked in the game menu? I like to play with a slightly larger font than the default. @cmk24, unfortunately the hack I use to be able to adapt the width of the list whether there is a scrollbar or not requires fixed height for each item. We need an engine update to be able to fix this problem. I have a new version that should work better with different font size. The text in the list should scale with the size chosen. Only the header still use a fixed size because there is an image behind it. Maybe we can remove this image and only use a different font color instead to be able to also make this text scale ? We will try and test it out this evening. I would leave the headers as they are. I don’t think they are a problem as the words stay the same. As long as the information that changes scales with larger fonts it should be great. Thank you for your continued work with this! This all worked fine for us when we tested it. Good work! I do have to add though that, for me personally, I still don’t like it nearly as well as the ver. 1.3 layout. There is still a lot of text jumping around leaving me feeling very distracted. It all emphasizes the feeling of a stat sheet, instead of an inventory. 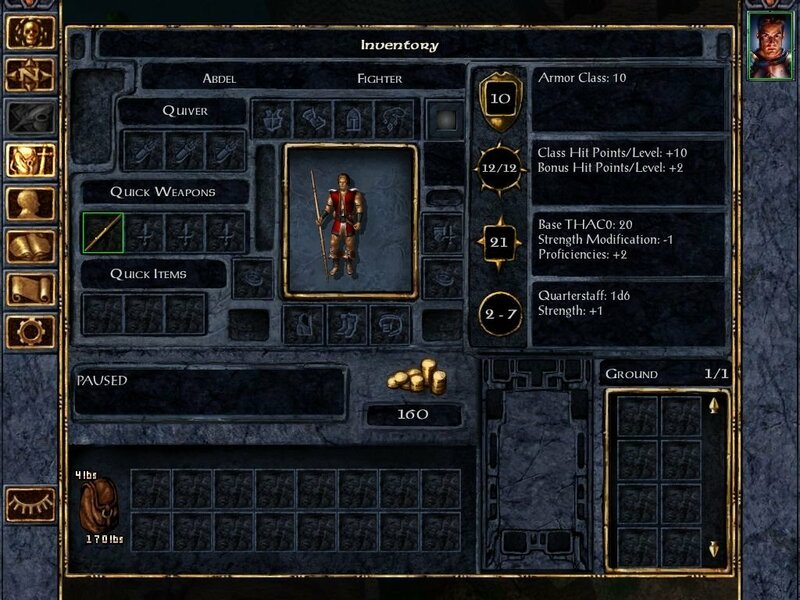 I really wish they would give us the option of a version 1.3 inventory screen. This takes nothing away from your work on this though, which is wonderful. This layout should contain the same content (only arranged in a different way). What are the changes from 1.3 to 2 that you don't like ? In version 1.3 there are only 4 icons and the related text is located directly to the right of each icon. It is natural for my eye to travel slightly to the right if I want more information then what I’m getting from the icon alone. When the text does change it only changes in the stationary fields, nothing jumps around. Of course some people like having more information available on that page, which is why there was so much discussion involved in coming up with the suggestions that you have duplicated. For me, all this extra information is not necessary for the quick reference that I need on my inventory page. I have always just right clicked the item for more information if needed, sometimes consulting the record screen as well. Trying to fit that fifth icon and much more information all into the same inventory screen ends up making it feel cumbersome and distracting for me. The most distracting part being when the different fields jump in and out of existence as you move your inventory items around. For years now I have enjoyed managing my inventory in what felt to me like a back pack. I pay attention to the stats on items but as a role player I don’t dwell on them. I start loosing that feeling of emersion when the stats start becoming the dominate part of any one screen. I hope that in the end everyone will have an option that they enjoy playing. And I know many will love this new screen. I just hope that those of us who have generally loved this game the way it was set up before will have that option as well. If you disable item comparison, the inventory in 2.0 is almost the same as in 1.3 and you can easily do this by modifying the UI.menu (you can also disable it in this tweak). The only thing that you can disable is the yellow highlight on the portrait. If you do this, you should be happy or did I miss any other differences ? For this tweak, it's strange that you feel that there is more information. The only addition is the fifth icon (and the category headers), the informations are the same. Yes, I was referring to the extra icon and information that all show on the screen at the same time, like the armor class modifiers missile, piercing, slashing etcetera. In version 1.3 that type of information doesn’t show in the inventory screen. For instance wearing studded leather. And then of course as you take things off and on the information and headers for those fields jump in and out. Having said that, I didn’t know the item comparison could be edited off yet. I thought that required a patch. Would you mind explaining how that is done? OMFG I LOVE THIS MOD! DUDE, YOU'RE THE BEST! The # of attacks in the upper-right corner is my favorite feature of it! It should be possible to filter the string to remove information you don't want. It can be done by editing the UI.menu file. I’m curious now. Is it possible for you to turn off the item comparison part of your mod so that the scrollable list doesn’t change when you lift up the armor piece? Using my example of studded leather, it would currently do this. Can that be turned off so that it just stays the same as not picking it up? I’m not saying that you should do that in your mod, I’m only wondering if that option is possible. I tried doing that, but it only disables the item comparison part (ie., the +/- numbers), not the portrait yellow highlighting (which is what irritates me the most). Yes, setting itemComparison = false does disable the item comparison screen from coming up. The other fields still do a lot of moving around but that probably won’t bother other people who are wanting more information there then they had before. Thank you again for your work and taking the time to answer my questions. @Ravenslight: Since it appears you can collapse the panels in the textbox, have you tried collapsing the armor panel (or perhaps all panels), to prevent all this "jumping around"? That does help some @Thels Thank you. @lefreut Not entirely sure where to put this, but I recently got a glitch with this mod (installed w/ @AncientCowboy mega UI mod on the newest BG2EE from GOG). The weapon slots just randomly disappeared, leaving a blank rectangle, though I could still use and see them on the main game screen. Loading didn't fix the issue (I tried that first since loading does fix the odd issues I'm having with the dialogue box), but quitting the game entirely fixed it for now. I'm not sure what caused it, though I'll keep an eye out for it happening again. However, there is a feature request in Redmine that seems to summarize it. Is that feature request an accurate description of your mod? Yes this component contains most of the things in the feature request. I have been using your mod for a while and I love it. What I like most is seeing the APR in the inventory screen. I've noticed, though, that the item comparison screen doesn't include the APR. Would it be possible to include it in the comparison?